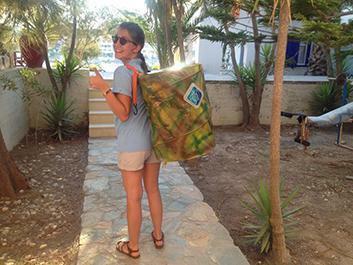 MEDASSET volunteers are a cheerful group of highly motivated individuals of all ages who share our vision and who wish to make a difference for sea turtles in the Mediterranean. In July 2014 we participated with our volunteers in the UpFestival; a famous summer open air music event in Koufonisi island, that brings together bands and young people from all over Greece. This tiny island, part of the Cyclades group in the Aegean Sea, is an EU NATURA 2000 protected site of great ecological importance and an up-and-coming tourism destination. Hellenic Seaways was our transportation sponsor. As the arena was located just a few meters from the sea and as strong winds were blowing, they designed and wore cool “sea turtle shells” that acted as litter bins raising awareness at the same time. The volunteers mingled with the crowd throughout the concert enjoying the music, while the shells on their backs were being filled-up with empty bottles! Some participants to the festival even asked if they could wear the ‘shells’ themselves! Litter was kept to a minimum, volunteers enjoyed the event and the participants got to find out about sea turtle conservation and what they could do to help! Later in July, another group of volunteers travelled to Naxos island in order to help remove 200 kilos of litter from just a 300m stretch of beach and inform tourists about the devastating impact of litter on the environment. 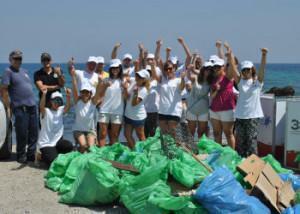 The cleanup was implemented under the 4 year long “Join In & Clean Up” campaign in partnership with the Coca-Cola System in Greece and under the auspices of United Nations Environment Programme/Mediterranean Action Plan. In November 2014, we participated with our volunteers in the international tourism exhibition “Philoxenia” in Thessaloniki, Greece. We reached out to professionals from the tourism industry inviting them to join our new campaign “Our Pledge to the Sea: No More Litter”,designed to target visitors to the Greek coasts (to be launched in May).